Les Hutchison has been hailed by the Well Society for his "fantastic gesture"
Well Society marketing chief Craig Hughes is delighted at a goodwill gesture from former owner Les Hutchison which will see fans’ donations have double the benefit. 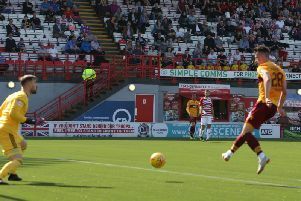 The Barbados-based philanthropist is owed £1.47 million by Motherwell FC as payback on an interest free loan negotiated when he agreed to sell the club to the fans for £1 in October. In a new initiative, Hutchison has now offered to match the total amount of funds raised by the Society in 2017 with a reduction of his loan by the same amount, to a maximum of £500,000. So every £1 raised will count as £2. “We were going to pay back Les what the club owes him over the next three years from transfer fees,” Craig said. “But this gives us the chance to do it a lot quicker. “It is a brilliant gesture by Les which helps us in a big way. “He didn’t have to do this. But before he left, he said he could keep giving us a hand in the future. “What he has done is brilliant. It shows he wants to help the club even after leaving. “It enables people to pledge to the club in a way which has double the benefit. Craig revealed the Well Society currently has 2060 members, paying anything from £5 a month in direct debits to one-off donations. “The amount of people who’ve joined the Well Society has been good,” Craig said. “We got a large number coming in after the ownership announcement in October. “This is the next push. More members will come on board on the back of this.